Regular readers of MilBlogs are aware of that the author of "A Storm in Afghanistan" announced in September that his wife's cancer had gotten to her brain. She died today. My condolences to a fellow husband and father. It has, in several cultures, been the habit of kings and presidents to issue pardons to deserving (and sometimes undeserving) persons on the new year. Here are some cases I think are deserving. Two Border Patrol Agents convicted of shooting a drug smuggler in the backside, in the course of his escape and while he was armed. The smuggler was granted immunity(!) for his testimony against the agents. They are meant to serve 11 and 12 years for attempting to stop his escape from American justice. These three men -- two agents of the law, and one wrongly handled by agents of the law -- deserve their freedom. Fuzzybear Lioness has the story, along with a retrospective of the case. Bryan Anderson's story is an important one to read, to see how the project has helped one fighting man begin the road to recovery. His family described the laptop as "the first step," because "it proved that he was going to be able to do all the things he did before." All of you who have helped, or donated: thank you. The Virginia Citizens' Defense League is proudly reporting that a member stopped a bank robbery the other day. The criminal, encountering an armed citizen, fled at once without a shot being fired or the citizen even needing to draw his weapon. SunTrust banks in the area have been robbed recently, but not this one. The story underlines a basic fact about an armed citizenry: its successes aren't always visible. The criminal, who wore a ski mask and immediately fled from the area, was not apprehended; indeed, the bank didn't even try to call the police, since they had no way to identify who it was. There is therefore no police report, no media report, nothing that would show up on a statistical study of crime. The citizen's gun was never drawn, only observed. We all share a citizen's duty to uphold the common peace and lawful order. As this story shows, sometimes all it takes is being devoted to that duty, and keeping the necessary tools to hand. "Was the injury serious?" the doctor patiently continued. "I didn't think so until now," she said. "But my mother insisted. The claws tore through the parka, and the shirt I was wearing, and my undershirt, and the underwear... but they didn't touch me! I figured I was fine." I've always been opposed to those "team building" exercises that try to artificially create the unity of spirit that only really occurs from genuine experience. ...and then each soldier produces a live frog from his right pocket. They then proceeded to BITE THE HEAD OFF THE FROG and throw its STILL KICKING torso onto the track. The Commander of the unit then produces a live rabbit and holds it by its hind legs in front of him. He pulls out an eight-inch hunting knife, and guts it from its belly to its neck. He grabs the incision on each side, and rips its chest and stomach open. He proceeded to STICK HIS MOUTH INTO THE CARCASS, AND COMES OUT WITH THE STILL BEATING HEART IN HIS TEETH!!! He passes the rabbit to each soldier, who takes a turn BITING INTO THE BLOODY INTESTINES!!! Hmm. Perhaps these guys are up to whipping the insurgents. There have been a lot of bad days in Iraq since I arrived last Spring. I start every day with the daily intelligence report, which leads off with how many people were killed over the previous 24 hours. Even on days where the violence is relatively light, it is still too many innocent families being torn apart by the nihilism of evil men. And while I am still fully convinced that our cause here is just, it is frustrating at times to realize that best intentions are not enough, and that the sacrifices our soldiers are making in the field every day (sometimes making the ultimate sacrifice) for a peaceful Iraq and a secure U.S does not seem to be improving the situation here. But today, the spirit of the Iraqi Security Forces was palpable, and you could see the pride on the soldiers' and policemen's faces as they marched, honored to be assuming responsiblity for maintaining Iraq’s security. Their clear devotion to Iraq as a nation renewed my hope that there is still a chance we can overcome the terrorists and extremists trying to destroy everything the Iraqi people want to build. Parades are meant to rally your spirits and manipulate them toward the ends of the parade-master. Nevertheless, I think that his take is right. The hope has always been that the enemy's ability to create chaos would eventually work against him -- that the people would come to be willing to create peace and order themselves, through any means necessary. The Coalition is not going to deploy the sort of force necessary to quell the insurgency, because you don't fight a successful counterinsurgency that way. You raise local forces that will do it, and make clear over time that stability and peace can only come through those forces and no others. Victory comes when your allies are seen by enough of the people as being 'their team,' so that the countryside fights for them and refuses to shelter the enemy. The other necessary condition is that the people have to believe that your side will be able to provide stability. As Bill Roggio reported from Anbar province, one of the chief problems we face in the Sunni areas of Iraq is that potential allies don't believe we'll stick it out. They cannot, therefore, commit to us -- they have to hedge their bets. That lack of commitment is a structural flaw in American foreign policy, one that cannot change, and it is therefore why insurgency is such a difficult thing for us to combat compared to more brutal, less free and democratic nations. The insurgents can hope to move our political will, in a way that they cannot hope to move (say) China's. That is why we must make a public recommitment to fighitng through the difficulties in Iraq, and seeing it through. There can be no end but victory on the table. This week's news from Somalia is being cast in some places as good news in the fight against Islamist movements; in others as bad news for stability. The truth is that the Islamists have never been able to hold ground when opposed by local forces backed with US power -- or by Western forces. What we are seeing there is what we should expect to see. It's important nevertheless, because a key element in the GWOT has to be ensuring that Islamist movements do not hold territory in their own name. It is one thing if the people of a state choose to institute some level of Islamic law in their public lives, as they do in Malaysia and parts of Indonesia; it is another to have an Islamist state, as the Taliban was in Afghanistan. Nevertheless, the hard part comes later in Somalia. It's always possible to break the Islamist hold on an area. It's defeating their insurgency, with its design of targeting the weak and the innocent, that is the challenge of the age. We must learn to do this; we must show that we can do it, not only once but reliably. Ethiopia will commit as we cannot, and indeed should not, and so we serve as advisors to them. The Iraqi fighting forces we are raising will likewise be brutal in a way we cannot, and cannot be forced to "go home" because they are home. Winning the tribes should have been the first, and must be the last, phase of the war. The Shi'ite tribes are increasingly in the right column -- that of the Iraqi government -- but the Sunni tribes have, if anything, relapsed. This is due to the fact that they cannot trust us to keep presence in Iraq, and pressure on the government to support their rights; they therefore fear the government of Iraq, rather than looking toward it as a means of ensuring their own stability. We must convince them both of our own resolve, and that the government of Iraq will not annihilate them. Otherwise, the government of Iraq will have to do so, as it is the only alternative to end the war. Surely, none of us wants that ending. The biggest news of the last week was the capture of the ranking Iranians in the region. Unfortunately, ther is not enough information in the clear to make judgments about. I suspect that is what Bush is really doing this week -- not 'rethinking the course' in a general way, but deciding what to do about Iran's involvement. Negotiation is widely suggested, but can only work to our advantage if we can find a way to negotiate from strength -- if we put a large enough stick on the table, that is, to go with the soft and diplomatic talk. If we have the courage to deploy such a stick, then I favor the negotiations; if we do not, then they are worse than pointless. Negotiation and diplomacy of that type is actively harmful. Wait, what? We're on the air? Oh, hello. Grim: "Are we sideways now?" I did manage to find my way to the computer today. This has not improved the situation. For one thing, I find that my favorite blawg has closed. Alas for Southern Appeal! We shall not see its like again. I've several things I'd like to talk with you about soon. Give me a day or two, and a supply of good beer, and I don't doubt I shall be at your service. If this is St. Steven's Day, I'm in... Where? Farmland outside of Indianapolis, Indiana, childhood home of the little wife (whom I met in Knoxville on her way to Savannah -- long story). Today, I'm going to the Eiteljorg Museum, and then will have a last dinner with the in-laws. Tomorrow, I'll begin the long trip back to my beloved South. I've been sick over the holiday, but thanks to my mother-in-law's application of dark Jamaican rum and coffee, I feel much better today. JarHeadDad can tell you that there's nothing like rum to make you feel better (eh, old son?). Hope all of you are well. I have a moment to check in after all, and I see that our friend Fuzzy has posted one of those silly holiday quizzes. "What holiday food are you?" it asks, and she reports being a Gingerbread House. Hope you're all getting your favorite holiday foods, whatever they are. Waes Hail! See you after the Yuletide. 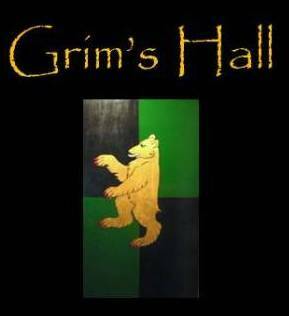 Grim's Hall has residents, to my certain knowledge, who are proudly Heathen, Christian, Pagan, or Jewish. I'm not sure if we have readers from other faiths or not -- since they haven't mentioned it -- but I wish to offer my good wishes to all of you. I gather from my email that Hannukah (or however you spell it -- I'm told there are several choices) is ongoing. I'm not sure what the right greeting is for that, but have a good one (I think it's meant to be a good one -- it's Yom Kippur where you set out to have a bad one, right?). One of you fed me a potato pancake last year, and it was delicious. So, while I don't know much about the holiday, it can't be all bad. The Winter Solstice is tomorrow according to my calendar, and drinc hail! Have one for me -- fate decrees that I will be on the road all day tomorrow, and so shall not be able to feast and celebrate as I would prefer on such a day. And, of course, next week brings Christmas and St. Steven's Day. Merry Christmas to all. I will be traveling until two days after Christmas, visiting distant family. I don't know if I will post between now and then, or have access to post. The best to you all, good people of good hearts, whatever tradition you cherish. All such are welcome here. Reader A.H. sends this piece by Jennifer Graham, from a "play barn" in the suburbs of Boston. I hope the horses are as disciplined as the children are suggested to be -- having met a few "play horses" in my time, I have usually found them to be on the verge of dangerous. A thousand-pound creature is not a toy, and if they aren't taught manners, they may "playfully" smash you. Or just by accident. The main thrust of the story is a reflection on the presence of filth in stables, which is surely one of the great truths of history. It is almost forgotten today, by accident of our suddenly sterile society. What does this mean for a story of a god born in a stable? The author has some thoughts. Chesterton also wrote on the subject, in "The God in the Cave." It's something I also reflect on sometimes, while working in the barns. No matter how hard you work, no stall that has ever held a horse is free of some evidence of that fact. If you're going to be with horses, you have to learn to accept the presence of that evidence. Ms. Graham suggests that associating with barns is humbling, and evidence of the particular humility evident in a god who casts off glory so far as to enter a barn. Is that so? If the Christian creation story is even close to correct, surely God cannot have a problem with the dirtiness of barns. It would have been his idea, after all, to make horses in such fashion as to dirty them. If he had a problem with barns, it would have to be with the existence of barns, not the dirtiness of them. It would have to be, in other words, with the keeping of horses in stalls -- not with the fact that the stalls then became dirty. If the story is an endorsement of barns, then, it must be an endorsement of humanity's keeping of animals, and rule over them. The favor shown to humanity, by one who had come to love them in spite of themselves, would be the point of the story. Surely that is the way to read the tale. Ron F., whose long service with the Boy Scouts is his main reason for fame here in the Hall, offers an excellent piece of advice in the comments to the survival post below. I know you said it above, but if you keep your head, hands and feet warm, keeping the rest of your body warm is one hell of a lot easier. Note that a stocking cap will stay on when you sleep when a Stetson won't. Wear a hat when you go to bed. That's right. The only time of year when I don't wear a Stetson is when the temperature drops notably below freezing. In my experience, a straw or light felt hat is best in the heat of summer; beaver felt or buffalo felt hats in spring, fall, and early and late winter; but for the depths of winter, you need something designed to keep your head warm, more than to keep it dry and shady. By far the best thing I've ever encountered for this is the Deerskin shell Mad Bomber Hat. Although it is the most expensive of the Mad Bomber Hats, it's still cheap for the price -- I bought one more than ten years ago, and expect it will outlive me. No matter how cold it gets, your head will stay warm. Wind and snow will not bother it. And, since it has a chin-strap, it will stay on while you sleep. For cold weather survival, I know of nothing better. It's far warmer, and more impervious to the icy wind, than any synthetic or knit cap I ever encountered. I prefer the company of serene turkey vultures overhead to that of a similar number of men, unless I can pick the particular men and am in the mood. Otherwise, I'll take the vultures every time. I know every dog within a mile of my house, though I know few of the owners. Wounded or frightened domestic animals follow me home, though they have never met me before. I've written about the joy of knowing horses, and of good dogs. There are a number of reasons to feel that animals ought to be treated better than they often are. The world imposes hard limits on us, however. Consider the Humane Society: it began as a collection of caring people who wished to improve the lot of domestic animals. It has become the chief slaughterhouse for domestic dogs and cats. Precisely because it has undertaken to ensure their welfare, it must kill the ones for whom it cannot provide. Any arbitrarily limited justice creates and maintains by its own existence the existence conditions of injustice. This is, I believe, the kernel of truth that lies in the famous, and apparently mystical, dictum that no one is saved until everyone is saved.... Contra the Stoics, true justice can exist only if it is extended to (many) nonhuman beings. I have a number of things to say about this article. I'll start by complimenting it. It is a beautiful piece. It does just what I like a work of philosophy to do: it starts with the Greeks, and does not limit itself to their philosophers, but explores also what their mythology tells us about the nature of their understanding. In addition, I think it does a good job of disposing of large parts of the Stoic argument -- in her sections on absurdity, Cavalieri shows logical and disciplined reasons why many of the facets of the Stoic argument are improper and cannot be held seriously. That said, she is finally, entirely, wrong. This is because she misunderstands both what justice is, and what the Stoics were saying. But it is not possible for us to act unjustly towards those who cannot be just towards us. Hence, for those who reject this reasoning, no other road of justice is left, either broad or narrow, into which they can enter. For, as we have already observed, our nature, not being sufficient to itself, but indigent of many things, would be entirely destroyed, and enclosed in a life involved in difficulties, inorganic, and deprived of necessaries, if excluded from the assistance derived from animals. I have highlighted the parts to which I will refer. As I said, there is much here that is not to the point, and I think Cavalieri has shown where those parts lie. Yet these things remain, and undo her argument. Cavalieri offers Nussbaum's definition and Aristotle's. She disposes of Nussbaum early, but for different reasons than I would. Martha Nussbaum states that, under the capabilities approach she favors - an approach stressing that individuals have the basic right to be “all that they can be” with the support of internal and external conditions - nonhumans, as conscious and purposive agents, do have entitlements based upon justice. Cavaleri asserts that this is too little; I say it is too much. Justice is a virtue that exists between parties. Normally, one party is being just to another. Nussbaum is speaking only of one party: a being is 'treated justly' if it has 'external and internal supports' that enable it to 'be all it can be.' If that is just treatment, who is treating it justly? Who is providing these 'external' supports, and at what cost? This establishes who the real moral agent is in the situation. If justice is providing resources to others, then the recipient is not being just, but only being treated justly. Who then is being just? Society, one supposes, since this is meant to be a universal formula: we are meant to treat everyone this way, and indeed (in Cavalieri's ideal) every animal. Societies are not just or unjust. A society has no virtue, no morals, no heart, and no soul. It is a name we give to a collection of people. It is the people who have hearts and souls, morals and virtues. A society is not just or unjust. It is made up of people who are just or unjust. They pass laws, either justly or unjustly because of the people's intent. Those laws are applied justly or unjustly, because people apply them. Thus, this vision of what justice might be cannot be correct. Justice cannot be measured in this way. Justice cannot be found in results. It has to be found in relationships. It is in how the people behave towards each other (or towards animals, to some degree -- we shall come to that). You cannot see it in the result, but in the process. More, justice has a cost. What is the cost of paying for 'external supports' that enable you to 'be all you can be'? More, if you need expensive medicines than if you do not. If we pay for one man who needs hundreds of dollars a day in medicines, how many are not receiving this sort of care? Where is the money coming from? If it comes from taxes, does it not impair my ability to 'be all I can be' if you take away my resources? Is it just to help one man 'be all he can be,' by making many men be somewhat less than they might have been? Cavalieri also cites Aristotle, with whom I normally agree. I disagree here, but I do not think the fault is Aristotle's, but that of language. Ancient Greek was a rich language, complex and capable of carrying many subtleties. Modern Greek, for example, has many fewer words. English is also a complex language, but we do not always have words that express precisely the same shades of meaning as the ancient Greek. When Aristotle says that justice means that "relevantly similar cases are to be treated alike," he is really speaking of something more precise than what we mean by "justice." The concept he is advocating here seems closer to "fairness," which is not the same as justice -- it is unfair that my neighbor escaped his traffic ticket since he was also guilty, but that does not make it unjust that I have to pay for mine. What do we mean, then? Justice is the virtue of using your power to achieve the kindest and most merciful result. 1) Justice requires a sense of kindness and mercy. 2) Justice is limited by practical circumstances. It does not require a "kind" and "merciful" result, but the "kindest" and "most merciful" result that is possible and practical. Return your mind to the Humane Society. The gentle-hearted souls who began it did not mean to slaughter kittens by the hundreds every year. Yet they do. Are they wicked? They are not -- no one feels the pain more than do they. Yet they know that, if they do not put down these children in a merciful way, they will starve or die of disease. This is not a kind or a merciful answer: but it is the kindest and most merciful. And, once stripped of its specific metaphysical background, the view that the sphere of justice should be limited by the interests of those to whom justice already applies reveals its true nature as an implicit appeal to privilege. What about the idea that, since we would (allegedly) live the life of slaves if we rejected their exploitation, we are entitled to maintain the institution of slavery? Privilege, or power, is implicit in justice. If you have no power over another, you cannot treat them either justly or injustly. It is in the relationship, not the results, that the virtue lies. 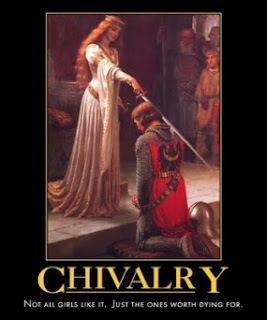 Indeed, that is why this particular virtue is a virtue. The people of the Humane Society are acting justly, even though they are choosing a course that the animal would presumably not choose for itself (i.e., instant death). They and we are acting justly when we choose which animals will breed, and castrate or spay the others. We would not submit to a similar system ourselves -- would indeed resist it with all our power -- but it is nevertheless an act of justice. I have known others -- Sovay in particular -- for whom this is not enough. For Sovay, she will do nothing that the animal would not choose (except spay or neuter, but let's set that aside for the moment). Yet the facts are the same for her. She can run her own personal 'no kill' shelter, and bless her for it -- no one living has said more in her praise than I have, and for good reasons I have seen with my own eyes. Yet still there are limits. She currently has, I believe, three dogs and four cats, all rescues except possibly one. This is the limit of what her resources will bear. This is all the justice she can afford. The Humane Society, by contrast, will take all that come to them. Better that, they have decided, than to let these animals die in the streets (or breed in them). Many, most, end up having to be killed. They have chosen to be responsible -- they have taken the power that goes with responsibility -- and it carries this price. This is the most justice they can afford. This is where the Stoics were right. First, to be just requires a sense of kindness and mercy. It also requires power. Animals are outside the human conception of justice, because of their nature. They have no sense of kindness or mercy, and they do not have the capacity to obtain dominion over others -- save that sort of dominion that is quickly resolved, for the purpose of nutrition. We do. We are different. There is no equine Aristotle. Insofar as justice is to be extended to animals, it will forever be us "being just," and them "being treated justly." That being the case, we must do what we can practically afford. We can treat a few animals very well, or many animals as well as we can manage -- which may mean that we can only kill them painlessly. That is the choice that this world presents us. This leads to the last and worst thing about justice I have to offer. Justice is not the normal condition of the world. It is something to which we aspire, but can only achieve conditionally, in some cases. Most of the time, in most of the aspects of the universe, there is neither justice nor an interest in justice. We should not expect justice. The best we can hope for is an occasional lapse in injustice. That is the world we have. You raise a good point about dominion. The word choice may be confusing. Horses, and dogs, and others, of course practice dominance in groups. What I meant by dominion was the larger quality to decide, as humans do for so many species, every aspect of their existence. A wolf or a horse who exercises dominance is doing so according to preset, instinctive rules. He does not have the power to change even his own society: he is only filling a role that his group is hardwired to require. An animal can exercise perfect power of that sort only in killing another. Men, on the other hand, have the power to take wild cattle and make veal; to take wild dogs and make Shi Tzu; or to take horses from Mongolia and make hotblooded Arabians suited to the desert. We can order our own society as we like, and to a large degree we can order the lives of others too: deciding who will breed and who will not, making breeds and species larger or smaller, faster or slower, and indeed now altering their hormones and increasingly their genetics for our purposes. I hope that clarifies what was meant by the word. Our co-blogger Major Leggett sends this story about his unit, from the LA Times. He's quoted in the article, which you wouldn't know from the article itself -- since he is identified as "Maj. Joel Garrett." On a related note, did you see today's 'Day by Day' cartoon? If John Donovan and BlackFive are right to say we know the family, I'd hate to think we here in the Hall didn't do our part. Life's been tough for a Marine Corps family lately, including the loss of a dear family member. Every year for the past three years they have lost a loved one between Thanksgiving and Christmas. This family has been an active support group for Marines for years - inviting troops into their home, participating in Operation Santa and other troop support projects, etc. Many of you who are in the military community and participate in discussion forums might be familiar with this family. We want to protect their privacy, but it's not right that such good people who have given so much to our country should not be feeling the joy and love of the Christmas season. So let's show this family the Christmas spirit! Please send them a Christmas card. We will get the cards to this family as soon as possible. Open your heart, and share the love of this Holiday Season with a family that has done so much for all of us! I understand that you've probably sent any holiday cards you were meaning to send -- and that they probably won't get there by Christmas anyway. All the same, we are a big family in a way, and I can think how I'd feel if the holidays had been a time of death and sorrow for three years running. Let's show them that they've got more friends than they realize. Another report from Bill, embedded with the Iraqi Army. I got the same email that InstaPundit noted, and have essentially the same reaction to it. The soldiers know Bill is there because he is on their side, and wants their story told. CENTCOM has a series called "Heroes in the War on Terror," which highlights good acts by soldiers, sailors, airmen or Marines. Today's is a little odd, in that -- while the act by the National Guardswoman was heroic -- it wasn't really GWOT related. She saved a drowning man, in West Haven, CT. When you hear the details, you'll understand why CENTCOM decided not to quibble about whether it was right for the series -- it's a story that deserves telling in any forum. The nursing student and Iraq War veteran jumped into the freezing water and swam out about 10 feet to where Tom was struggling for air. I feel sorry for our friend Cass, who has managed to enrage apparently half the world. I don't think it's even her fault. But I'm getting ahead of the story. If you don't read her blog (and you should), a few days ago she tossed off a post in reply to an advice column, which she titled "Idiot." You wouldn't think a short post that derived from an advice column would generate a lot of heat, but it did. After it went over a hundred (mostly rather hot) comments, she wrote a second post to explain the first. Today, she had to write a third post to reply to anger directed at the first two. The problem is this: people are trying to read from the specific to the general -- and, in this case, "the general" is a very dangerous place. It's a place where many people feel very vulnerable, and want to assert boldly in order to cover how uncertain they really feel. I'm not sure this particular specific, though, holds general lessons. The woman in question is unusually stupid and shallow. It's always dangerous to read general lessons from a single example, but especially when the single example is so far to the left of the bell curve. I guess this article is interesting to many people, as it was carried in a "popular" magazine and linked today at InstaPundit, a very popular blog. Obviously, lots of folks are captivated by recent stories about people who died of exposure this winter, and are fantasizing about what they would do in such circumstances. Well, nothing wrong with that. Fantasy can be a useful way to prepare your mind for challenges. I expect my readership, however, will mostly enjoy the article by mocking it. Water Jug: Got a condom aging in your wallet? [No.] In a pinch, it can carry a gallon of water. [How did you figure that out, I wonder?] (Unlubricated tastes best.) [I don't even want to know how you figured that out.] To make it easier to carry, sling the improvised water bag in a bandana. The bandana is the best idea I've heard yet. I've never been on the tech-heavy side of survival. As I said on the subject of First Aid Kits, one of these and one of these is all you need. You can do everything from rigging a tourniquet to a sling, stop bleeding, bandage a wound, whatever you have to do. By the same token, wilderness survival is easy. Don't complicate matters. 1) Know your environment. If you know where to find water, what sort of makeshift shelters are appropriate, and how to navigate the kind of land where you live -- you're going to be all right barring injuries. 2) Learn first aid, to maximize your chance of dealing with injuries. 3) If you have to travel in cold weather, keep some extra clothes (including boots) in your car or truck, enough for the coldest weather you're apt to encounter. It really doesn't take much to be warm enough to survive. Keep your head, feet, hands and groin well insulated, and the rest of you out of the wind. 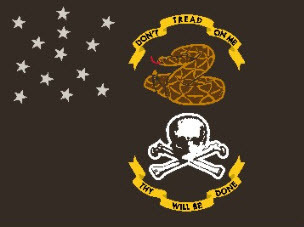 4) Always carry a book of matches, a good knife, and a bandana or silk "wild rag," preferably the latter. Always wear a good hat. It's not a bad idea to keep a heavy caliber handgun in your glove box or on your person, as appropriate with local law. That's all the equipment you need to survive in North America. That's it. You don't need to be McGyver. Just be a cowboy. You'll be fine. UPDATE: The wife, who used to teach cold-weather survival for the Girl Scouts, suggests some sort of disinfectant as a third "must-have," to go with the wild rag and the bowie knife. In truth, I do keep rubbing alcohol in the truck for just that reason -- it just isn't something I carry on hikes or horseback rides, though it would be wise. If you read Watching America, a site that translates and publishes world writing about America into English, this note is for you. WA has been under a denial-of-service attack for several days. They want you to know they will be back up as soon as they can -- keep checking back. They're not going anywhere. UPDATE: They're back online now.